Rolling Dog Farm: A Double Adoption! 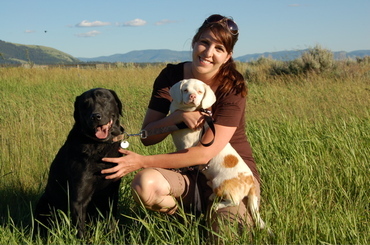 Last weekend Wendy M. from Missoula came out to visit with a few of our dogs she was thinking about adopting. After taking them for walks and hanging out for a while with them, Wendy fell for not one but two of our disabled dogs -- blind-and-deaf Baron and blind Stoney! 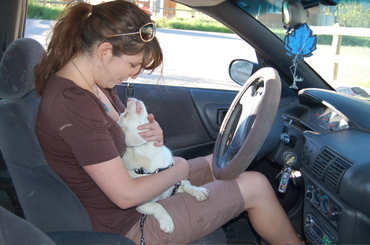 Wendy said she wanted a cuddle-bug little dog who just wanted to curl up in your lap and snuggle, and she also wanted a dog she could take for hikes and long walks. Well, Baron fit the first requirement perfectly and Stoney was the energetic, outdoorsy dog. So when she left the ranch last Saturday, Wendy said she wanted to buy some dog beds and other things to get her house ready (she already had a fenced yard), but that she would return at the end of the week to get the two dogs. Happy endings are the best! Baron undoubtedly has found a great sleeping spot, too! Could it be a human bed? And Stoney - I haven't met a lab that didn't love water so she will be listening for the creek sounds every day! Special needs = special love so all are blessed! I am so happy for Baron and the new family! I feel so stupid calling Stoney a "him". It dawned on me on my drive home what I had written! Maybe it was because I have a huge black lab/rott cross "Bear" who reminds of Stoney and he's a male. Sorry Stoney. Stoney is still a very lucky GIRL!!! I just LOVE your blogs each day! Really cute stories about your buddies!! Thanks alot!! What a happy story! Congratulations Wendy on your new babies! I believe they are going to have it made at their new home!Thanks for making my day! She looks just like the bachelorette DeAnna! Congrats on your new family. I just LOVE stories like this!! Wendy is an amazing human being and how lucky we are she will care for these two special dogs. Greats news to hear that two cuties have been adopted! Wendy, keep the blog readers posted on how your furry kids are doing. Loved the photo posted on the web! Such adorable pictures. I can feel that snuggle through the screen. And Stoney has her own creek! I wish many happy and fun days ahead for this beautiful trio. Best wishes Wendy for you and your new furry babies. And as always thanks RDR for giving these precious animals a new and love-filled life. I'm so lucky to have these two! Baron has decided that he should sleep with his head on the pillow just like a person would. And Stoney has taken to placing herself so close to the floor fan, I think she's going to cut her nose off! Thank you for allowing me to take these two precious animals into my home! Thanks for taking these darlings home with you Wendy! I hope you enjoy many hikes with Stoney and quiet lap sittings with Baron. Sounds like these dogs are a perfect fit for your life. Congrats Wendy on two wonderful new family members! I can see that the bonding has already begun! That pic in the car is just precious. I wish you years of love together. What a great way to start a new week! I'm so glad for Wendy, Baron & Stoney... They can now look forward to a long, happy life of snuggling and hiking together! Stoney has been our favorite for years--Wendy is one very lucky girl! I can see how she could not make the decision and took both. I'm so happy for Stoney and Baron. My husband and I discussed adopting Stoney and Baron but if you snooze you loose!!! This is great news! I hope we have future blog updates on these two very special pups! Hooray! Twice blessed. Congratulations to all three, for a long and happy life together. What great news! I am sure baron and stoney will be very happy in their new home!